As the title of this project confirms it offers up to 12% daily. This project is listed on DavidNews.com Golden Stage position with $400 reinvestment since 14th of January. The overall project has been online already 12 days, and I must say that some investors like this project. 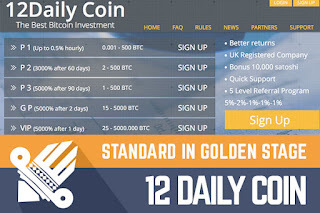 Despite the fact that 12 Daily Coin is placed on Golden Stage position it is quite a common project. From the design point of view, it will be clear to everyone that project is simple and does not surprise in any way. In site is used pictures that are seen in several other project and this is not a good impression at all. Some good things - in this project your balance will grow every second and it is possible to withdraw interest instantly to your account balance. In my mind, it is quite strange that account balance is in Bitcoins when you have deposited with Perfect Money or Payeer. The project is interesting only for Bitcoin players, but I must admit that it offers exciting investment plans for Bitcoin gamblers. That is all. I do not put big hopes on this project, but on the other hand, it is just my personal opinion. Invest only that you can afford to lose. Investment plans: 0.15% (3.6% daily) up to 0.5% (12% daily) hourly for unlimited term, possibility to withdraw initial deposit anytime after 1 hour. Forget about other investment plans. Join 12 Daily Coin Here! If you are searching for the ultimate Bitcoin exchange service, then you should pick Coinbase. Claim free bitcoins from CLAIM BTC. 21 to 57 satoshis every 20 mins.